Lot:9427 Fr. 2201-Klgs. 1934 $500 Federal Reserve Note. PCGS Currency Gem New 65 PPQ. Fr. 2201-Klgs. 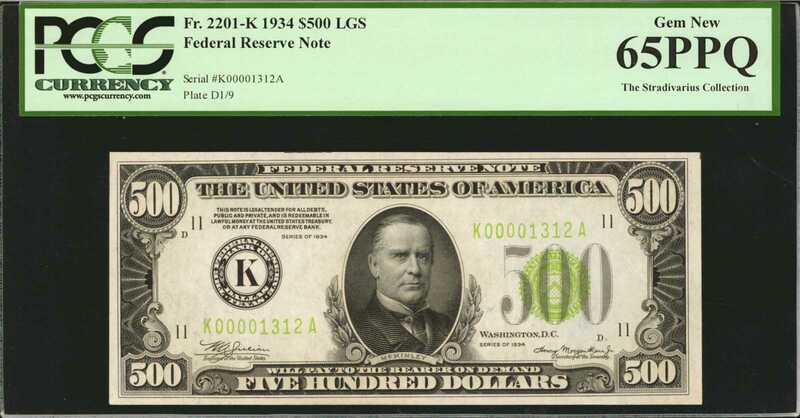 1934 $500 Federal Reserve Note. PCGS Currency Gem New 65 PPQ.Despite the onset of the Great Depression in the late 20s, business was still flourishing in Dallas Texas. In 1930, oil was discovered 100 miles east of Dallas in Kilgore, spawning an East Texas oil boom that made Dallas the financial center for the oil industry in Texas and Oklahoma. In the first months of 1931, 28 petroleum-related businesses either moved to or formed in Dallas. Banks made loans to develop the oil fields, and Dallas became the financial center for all oil fields in the Texas Panhandle, the Permian Basin, East Texas, Gulf Coast, and Oklahoma. People in Dallas viewed the Great Depression as a phenomenon affecting only the eastern United States, not Texas. Alas, by the middle of 1931, falling prices and overproduction of oil put thousands of people in Texas out-of-work, bringing the worst economic downturn in history to Texas.ppBureau of Engraving & Printing records show that over 31,000 1934 Dallas $500s of both seal color varieties were printed; with the Texas economy at a virtual standstill & bank closures due to insolvency at an epidemic level, there was little or no demand for high-denomination banknotes. Consequently, most of the Dallas $500s that were printed were never released. ppMiraculously, our exceptional Gem 1934 $500 Dallas LGS survived. It possesses all the attributes of greatness, quality & rarity, along with originality & riveting eye appeal. This note, like all notes in the Stradivarius Collection is in a class by itself & deserving of a record realization.From the Stradivarius Collection.